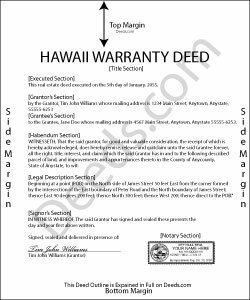 A warranty deed is a legal document used to transfer, or convey, rights in real property from a grantor (seller) to a grantee (buyer). This type of deed provides protection for the grantee by guaranteeing that the grantor holds clear title to the real estate and has the right to sell the property to the grantee. This guarantee extends throughout the property's history. The grantor also guarantees that they did not encumber the property in a way prohibiting transfer, and that the deed reference all easements, restrictions, or other agreements of record that relate to the specific parcel of land. A warranty deed, once acknowledged or proved and certified as provided, should be recorded in the recorder's office in the county where such lands are located. Hawaii maintains two separate systems for recording: Land Court (Torrens) and Regular System. The Bureau of Conveyances records for both Land Court and Regular System. Check the prior deed to determine which system to record in. A label appearing in the upper left-hand corner signifies recording in the Land Court system; a label in the upper right-hand corner signifies recording in the Regular System. If both sides contain labels, the deed is dual-system recorded. Registered land, and the ownership thereof, is subject to the same burdens and incidents that are attached to unregistered land (HRS 501-81). Every conveyance that is not recorded is void as against any subsequent purchaser, lessee, or mortgagee in good faith and for a valuable consideration, not having actual notice of the same real estate or portion thereof, or interest therein, whose conveyance is first duly recorded (HRS 502-83), so make sure to record in the correct system, and consult the BOC or an attorney with any questions. A warranty deed must include the grantor's full name and marital status, as well as the grantee's full name, marital status, mailing address, and vesting. Vesting describes how the grantee holds title to the property. For Hawaii residential property, the primary methods for holding title are tenancy in common, joint tenancy, and tenancy by the entirety. An estate conveyed to two or more people, including spouses, is considered a tenancy in common, unless the conveying instrument explicitly expresses otherwise (HRS 509-1). A lawful warranty deed must also be signed by the grantor and must have an acknowledgement endorsed on it or attached to it in the form provided or authorized by sections HRS 502-42 or HRS 502-45 (HRS 502-41). Acknowledgements can be made in Hawaii or in another state. Pursuant to HRS 18:247-1, documents conveying real property are subject to a documentary transfer tax. Include Form P-64A (HRS 18:247-6(a)) when recording to fulfill this obligation. If the document is exempt from this tax, include Form P-64B (HRS 18:247-6(b)). See HRS 18:247-3 for a list of documents exempt from the tax. Consult the State of Hawaii Department of Land & Natural Resources Bureau of Conveyances for a checklist of format and content requirements before submitting the deed for recording. This article is provided for informational purposes only and is not a substitute for the advice of an attorney. Contact a lawyer with any questions about warranty deeds or other issues related to the transfer of real property. samantha b. said: excellent instructions and the examples made completing the forms so very simple. thanks so much. Reply from Staff: Thank you Samantha. george k. said: Thank u the site helped me get the quick deed forms I needed for TN.i will use it in the furture.